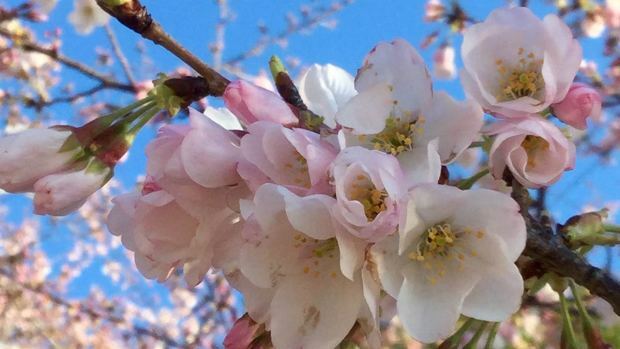 The cherry blossoms around the Tidal Basin have officially reached peak bloom, the National Park Service (NPS) announced, and yes -- there's a scientific method to determine that fact. The NPS said that both natural indicators (a physical inventory of the trees) and weather data (showing that the 220 "heating degrees: required for bloom had been reached) herald the official start of peak bloom. Peak bloom is defined as when 70 percent of the Yoshino variety of trees being in full bloom. Of course, the trees have been gorgeous pretty much all week -- but now that peak bloom is here, you can expect even better sights... and even bigger crowds at the Tidal Basin, of course. Peak bloom lasts about four to 10 days, the NPS said. "The weather forecast through the middle of next week shows slightly cooler temperatures, which will slow the bloom process and help to keep the blossoms on the trees," the NPS said in a release Friday. "However, severe weather, such as heavy rain or strong winds, can cause the blossoms to fall early." And even after the Yoshino trees have lost their blossoms, that's not the end of the beauty. Other varieties of cherry trees bloom after the Yoshinos, including the Kwanzan trees. The NPS said 10 percent of all the trees around the Tidal Basin and the National Mall are Kwanzans. They're expected to start their peak bloom on or about April 5. "Kwanzan trees are most common on the Potomac River side of East Potomac Park," the NPS said.